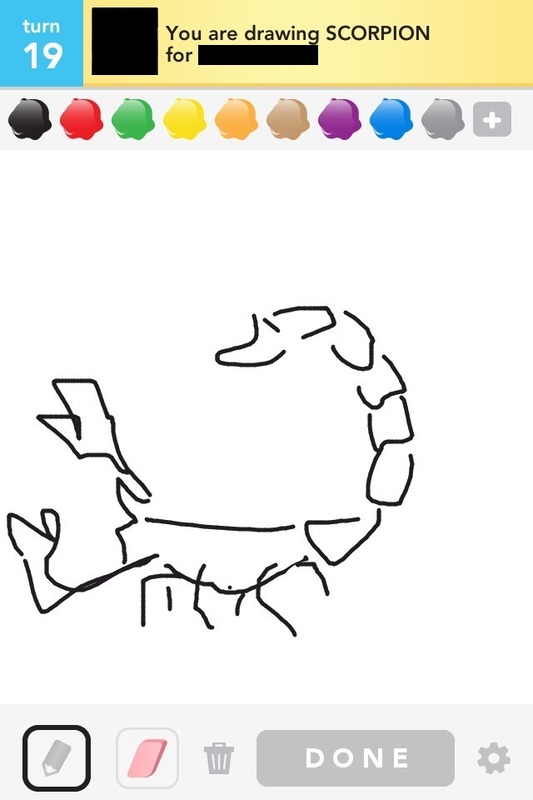 A couple of weeks ago, I started playing a fun game on my phone called DrawSomething. It’s a really addictive game, enough so that it made me think a little bit about how the things that work about the game might apply to blogging, which is what my day job centers on. I had previously let myself get hooked on FarmVille, which is also seriously addictive, but in a less meaningful way. Let me clarify that a bit. In FarmVille, you do what amounts to menial labor and have non-semantic interactions with others who need more points to gain better tools for doing menial labor on their own farms. The interactions are about meeting game objectives and not about exchanging real information with friends. Plant some crops, wait until it’s time to harvest, pester your friends to give you a sheep so that you can get a tractor so that you can plant crops in a less tedious manner so that you can maximize efficiency as you rotate your crops for optimally timed harvests and increased profit. And so on. The key thing FarmVille and similar games lack is creativity. Enter DrawSomething. 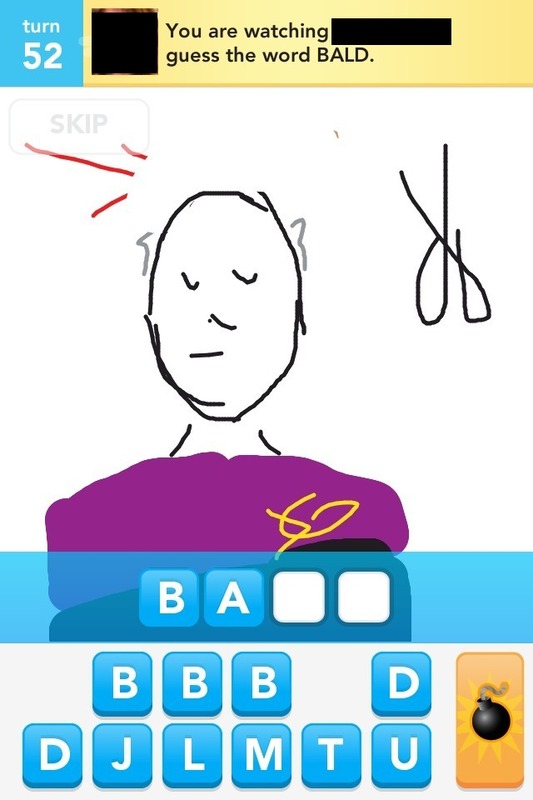 The premise of this game is that you choose one of three words displayed and try to draw it. A friend tries to guess it. There’s lots of opportunity here to include in-jokes or other information that has meaning within the context of your particular friendship with this person. If you’re given the option to draw the same picture for another friend, the context changes and you may render it in a wholly different way. The game requires short bursts of creativity. You’re thinking, and doing so within fairly tight confines (the phone screen is only so large, and you have only so many colors and line widths and your own clumsy fingers). And you improve your thinking as you go. Mess up a drawing with one friend and you can bet you come up with a better drawing the next time you select the same word to draw for another friend. But that’s just the first part of the game’s premise, for you also get to play back your drawing and your friend’s attempt to guess it. That is, you get to watch as he taps out his guesses as to what you’re drawing, and to see at what point during your sketching he has the “aha!” moment. It’s built-in feedback for how sound your thinking was as you decided how to draw a picture. Of course you also get to guess what your friends have drawn, which allows you to be on the receiving end of in-jokes and other personal references. The guesser is given a slate of a dozen or so letters to choose from when guessing, along with a set of blank spaces to fill with letters. So you can use the drawing, the number of letters you know the word to have, and the letters available to choose from as parameters for figuring out what your partner has been tasked with depicting for you. I’ve guessed words a time or two almost before the drawing commenced, based only on the letters. Basically, you get to exercise several brain muscles while guessing. Sometimes it’s like Pictionary and sometimes it’s more like Boggle; the most fun rounds are a perfect combination of the two. Pictionogglary, I suppose. Although I began to get a bit of game fatigue as I had a half dozen or so games going at once, it was still a very fun game, with these little bursts of creativity, perfect for 3-minute slices of time between tasks. It’s the sort of game that, even if you tire of it, you can pick back up days or weeks later with nothing lost and without diminished satisfaction. Yesterday I learned that Zynga (makers of FarmVille) had bought the company behind DrawSomething. I suppose I shouldn’t be surprised. The game had a meteoric rise to popularity, and Zynga’s known for buying game shops that have demonstrated success. I don’t play Zynga games anymore. I should disclose that Zynga bought the last company I worked for and that I opted not to go along with the others on the crew who went to work for the new ownership. I should also pause and say that I admire and respect the people I used to work with. They were a smart, dedicated bunch of guys who made career moves and seem to be doing well. I was glad to learn recently that some of the nasty rumors I had heard about working for Zynga have not turned out to be true for the guys I know. So maybe things aren’t all that terribly bad at Zynga. Still, there are the stories of unscrupulous business practices. There’s very clear evidence that Zynga has ripped off game concepts from other, smaller companies (FarmTown rose before FarmVille as I understand it, and the latter has nearly identical gameplay, or it did when I was playing it a couple of years ago). And you just hear bad things about Zynga CEO Mark Pincus. Rumors, rumors, I know. It’s stupid to base anything at all on unsubstantiated rumors. Still, I’ve just never had a good feeling about the company. And I’m not interested in supporting their work by playing their games, even if I never send them a nickel (and even while wishing the best for my former coworkers). So now I’m done with DrawSomething too. One of the things that DrawSomething really highlighted for me was that the Zynga games I played were really awful and empty in terms of how it felt to play them. (To be fair, since Zynga rips these games off, it’s not the company’s fault the games are soul-sucking; big Z sure is good at purveying the games, though.) The games basically stick you into this irrational, Ouroboroean loop of producing so that you can consume so that you can produce, with no external reward or meaningful internal pleasure at having done so. Raise enough crops to get a few coins and you can buy a new kind of crop to raise so that you can produce another kind of crop that you can raise enough of to buy a tractor, and so on. It becomes a real grind made worse by the fact that if you don’t tend your crops quickly enough, they wither in the field and you’ve wasted a planting cycle, which just makes you feel bad. Any sense of accomplishment is derived not from achieving a thing worth achieving but from staying in the game’s loop. This becomes downright stressful over time, and near-solipsistic. Sometimes you just need to escape the loop. 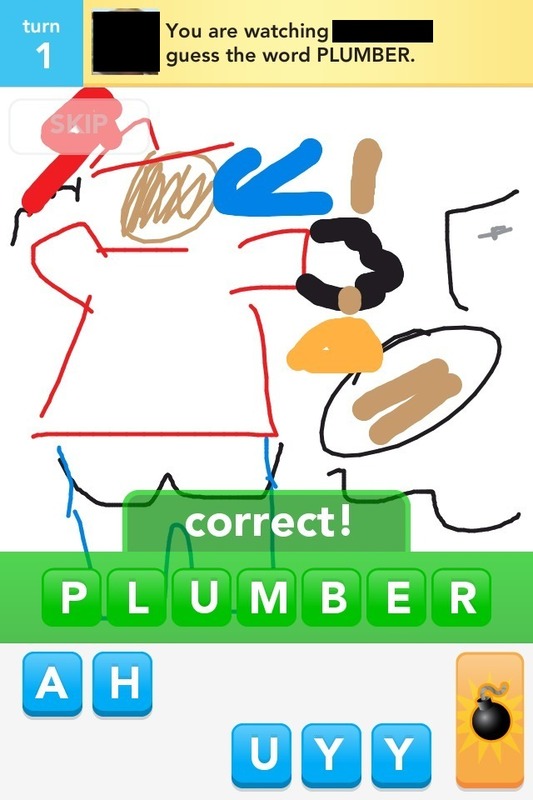 By contrast, the little bursts of personal context and creativity that DrawSomething afforded me made the game pleasing not because of the game itself but because of how it made me feel to have shared a laugh with a friend or made a picture that was recognizable, funny, at times even crudely artful. One of the things that strikes me about games like FarmVille is that they’re absurdly frivolous. There’s nothing really worthwhile about them (except that occasionally Zynga has tried to wring more money out of people by purporting to donate some portion of proceeds earned over a given time period to charity). Of course, there’s not much worthwhile about DrawSomething either, at least nothing worthwhile in the world-peace/stopping-hunger way. But at least there’s a glimmer of human connection, of life outside the game. There’s a sense that somebody you know is at the other end of the line drawing a picture especially for you. Curiously, I’ve always thought myself a pretty happy-go-lucky guy. I cheerfully make fart jokes and giggle at things people repost from George Takei on Facebook, for example. I enjoy puns and silliness of many sorts. Yet as I’ve grown older and more curmudgeonly, I’ve begun to notice that I have a much lower tolerance for frivolity among ventures that steal away much of my diminishing time and attention for the more serious things I’m interested in. I am, in other words, good for a quick silly exchange or a peek at the odd humorous web site, but on the whole, if I’m spending any appreciable amount of my waking time on something, I want to spend it on something that nourishes me in some way or another. I realized at some point that FarmVille was not only not nourishing to me but was actually toxic, and so I quit playing. My job these days is helping people have good blogging experiences on WordPress.com. As I thought through the things I found delightful about DrawSomething, I thought about how we might bring similar delight to users of our service. Blogging and receiving comments on your posts can certainly be rewarding, but helping people make better and more meaningful connections with their readers, and with other writers, is always on our minds. Years ago, a friend introduced me to the notion of the grilled cheese sandwich blog, which has now been pretty solidly taken over by Twitter. The grilled cheese sandwich blog houses the sort of vacuous post in which you share inane things about your life that nobody with any sense cares about. It’s the epitome of frivolity. If I’m going to get on any sort of a high horse about the frivolity of games, then I suppose I ought to think hard about the frivolity of the thing that puts bread on my table. I don’t guess you can ever keep people from writing about their grilled cheese sandwiches, and you ought not to want to either. It’s a free world (at least if you’re a straight white guy above a certain tax bracket), and I’m generally a live-and-let-live kind of guy. But if there are things I can do to help convert frivolity into meaningful expression or, in the best case, human connection — much as DrawSomething became for me a more nourishing game than FarmVille had been — I think I’d like to try. I won’t be so dramatic as to pronounce this as the kernel for a professional manifesto, but this stuff is very much on my mind these days.